The Hankey Pass is a tarred road of fair quality. It connects the farming town of Hankey with the N2 Highway and Humansdorp . The Gamtoos Valley is the epicentre of the citrus farming industry in the Eastern Cape. The point where the pass starts is at the low level bridge over the Gamtoos River. The pass is of above average length at 7,1 km and has an easy average gradient with the steepest sections being near the summit at 1:12. The road is suitable for all vehicles in any weather and although showing signs of ageing, is still in a fair condition. (2018) The road is scheduled for resurfacing and upgrading later in 2018. Set some time aside to explore some of the historical points of interest in and around Hankey. This 4 km long official pass is named after the Hartbees antelope, which once roamed these plains in their thousands. The pass is insignificant in the greater scheme of things and has only one gentle bend and a small alttitude variance of only 66m. It's located on the P0663 / R391 north of the much bigger Groot Doringhoek Pass about 20 km north-west of Molteno, just off the tarred R56. The Helspoort Pass is located on the tarred R350 and connects the towns of Grahamstown and Bedford. Both towns have plentiful history dating back to 1820 settler days and it is here that the British forces entreched themselves initially. There were several forts built which are still standing today. The pass has plenty of bends, corners and curves - 21 of them in total - and hardly any straight sections. It only has a small altitude variance of 67 metres and has a very comfortable avrage gradient of 1:94 with the steepest parts being at 1:28. The pass is suitable for all vehicles, but note that overtaking is difficult due to the many corners. Comply with the speed limits and obey the barrier lines and all will be well. This little-known pass is located in a wild and remote area of the Eastern Cape near Barkly East. It forms the northern access route into Heuningneskloof (“Honey Nest Ravine”), a long valley formed by a tributary of the Kraai River. The use of a 4x4 vehicle is strongly recommended, although a high-clearance vehicle could probably traverse the pass, albeit with some difficulty. It lies far off the beaten track, and some accurate navigational skills and common sense will be required to find it. For those that do make the effort, you will be rewarded with exceptional views, the peace and quiet of an unspoilt environment, and some challenging driving. Hobbs Hill is located just 3 km north of Cathcart and whilst it's a short pass at only 2,7 km, it descends a substantial 132m over that distance producing an average gradient of 1:20 with the steepest section being just north of the summit at 1:14. This is generally a safe, well designed road and only contains two easy curves. Having a summit altitude of almost 1200m means this pass is sometimes subject to winter snowfalls. The usual snow driving precautionary measures apply. The tarred Hogsback Pass is located between the Eastern Cape towns of Alice and Cathcart. With an altitude variance of 379 meters, this pass summits at 1200m ASL which means it regularly experiences snow during the winter months. 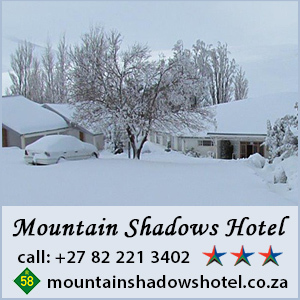 Hogsback is a mystical place, with dense and tall forests and the mountain is frequently shrouded in mist. South African born author J.R.Tolkien is said to have been inspired by these forests when Lord of the Rings was written. When travelling through the Baviaanskloof from west to east, the Holgat Pass is 5th pass you will need to traverse - the first four being the Nuwekloof Pass, Studtis Poort, Grasnek Pass and Langkop Pass. The Holgat Pass is often confused with the Combrinks Pass which lies a few kilometers further east. The pass is essentially the ascent up the final big mountain climb for travellers heading eastwards, interrupted by a high altitude plateau (where the Bergplaas campsites can be found) followed by the Combrinks Pass as the descent. If you are new to the Baviaanskloof, we recommend first watching the Orientation and Overview video. The pass contains 49 bends, corners and curves within its 4,7 km length and 10 of those corners are greater than 90 degrees. The road is partially strip concreted and sections of the concrete are in poor condition, making for quite a bumpy ride. Most of the pass has steep, unguarded drop-offs and drivers need to be alert. Overtaking is impossible and passing vehicles travelling in the opposite direction will require both vehicles to move over to create sufficient passing space. The Indwe Poort was formed by the powerful Indwe River and forms a steep sided poort through the mountains south of the town of Indwe. The road, whch carries the route label of R396 connects the town of Indwe with the main tarred road, the R410 just south of the poort, where the Indwe River continues flowing southwards to feed into the large irrigation dam - the Lubisi Dam. The Indwe River provides a lifeline of water to this region as just north of the poort it feeds another large dam - the Doringrivier Dam. The road follows the course of the poort along it's western side for almost 10 km and is generally an easy drive with gentle gradients. There are two very sharp corners in excess of 110 degrees that need to be approached with caution, but the biggest dangers on this road are corrugations and livestock. Be aware of this before you tackle this poort. The road has a minor summit towards its northern end, followed by no less than 5 smaller false summits along its length. Janspoort is a very minor tar pass located on the R58 between Burgersdorp and Venterstad near the northern border of the Eastern Cape. It is virtually the only structure to break the monotony of this otherwise featureless road. The surface is in a good condition, probably because there is very little traffic, and can be driven in any vehicle without problems. We have been unable to establish the identity of the “Jan” that this pass was named after, or why he was important enough for this pass to bear his name, but we can be fairly certain that he was a farmer in the area, or an important personage from one of the Anglo-Boer wars. Jouberts Pass is a steep, high altitude gravel road pass located between the towns of Lady Grey and Barkly East in the quiet rural region of the Eastern Cape close to the Lesotho border in the Witteberg Mountains, which is itself a western spur of the mighty Drakensberg. Very few people traverse this pass other than local farmers and avid adventure travellers. We recommend completing the circuit, eventually arriving back at the R58 after quite a long but fabulous gravel road loop, which includes Jouberts Pass. It is best driven in a clockwise direction if the pass is going to be driven at any point after 11 am. The pass is suitable for all vehicles in fair weather, but if there is heavy rain or snow on the pass, a 4x4 will be mandatory.